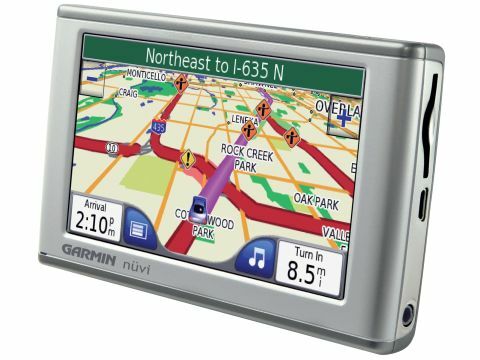 Garmin's new nuvi GPS sat nav device bills itself as a 'personal travel assistant'. Unlike other GPS devices, this machine isn't just designed to sit on your dashboard and coo "turn left" and "turn right". Rather, when you've arrived at your far-flung destination, so the theory goes, you pop the nuvi into your pocket and take it with you. If you get lost while walking, it can give you street level directions. The machine also functions as a basic phrase book, reading out useful requests and questions in French and German. Beyond all that, there's a currency converter, restaurant guides and a world clock. Get tired in your hotel room and you can listen to MP3s - albeit on the nuvi's terribly tinny speaker. But, what's it like when you're out and about? Well, the simplest answer is that it's excellent. Right from the off it scores bonus points by having quite simply the best windscreen mounting kit we've seen. The device uses a universal ball joint that allows the nuvi to adapt comfortably to even the oddest of windscreen angles. It's an extremely simple piece of design but it works beautifully, and is certainly far better than the tortuous cradles, hinges and bars which some systems favour. Typing in your destination is simple too. In the UK, just enter the postcode followed by the house number and you're away. When you're driving, the nuvi's screen is large enough to comfortably show key turnings and details. The display also performs well in differing light conditions, such as bright glare. When you're driving at dusk, the machine will also dim the display. This is a nice touch and can be configured to happen automatically - using a built-in clock - or manually. It's a shame that it lacks a light sensor; many devices can now do this automatically. The nuvi also has text-to-speech software which reads out place names. We found this quite reassuring, particularly when navigating around new and built-up towns. With all these plusses, the nuvi is certainly a very attractive buy, but at £399 it costs the same as the TomTom 910. So which should you buy? We would say the TomTom - both devices are very expensive, but the 910's maps cover a wider area. It's a tough call though.